After ending 2009 with one of the hottest tunes of the year with a staggering 3 months hitting No.1 on the top100 traxsource charts with the remixes of his classic ITS THE SPIRIT on the Underground Collective label. Romain drops the first Jam of 2010 on his own Nu Faze label. 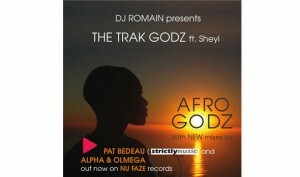 Dj Romain presents the TRAK GODZ, Afro Godz is the first release from the production team DJ Romain and Pat Bedeau. The pair met at the Miami Winter Music Conference 2009, but it was during Romain’s 2009 dj UK tour, when he heard Pats productions, like Just Can’t wait featuring Chanel produced with Steve Gurley and Affection Ft Shishani he produced with Kenny Large from Amsterdam and was feeling Pat’s production skills. It was when Romain, Pat and Sheyi met at a Tribe party in london(brixton) they all decided to work together and to get into the studio, and the TRAK GODZ were born. Afro Godz, is deep, tribal, Jazzy Afro drum workout with authentic vocals from Yoruba percussionist, singer songwriter SHEYI, Sheyi envokes the Oristhas and acknowledges the princlings of Africa. Afro Godz is a Yoruba infused deep house workout. South African Soulful scene, comes with their enchanting remix, that builds and builds and builds, with deep melodic bass and haunting strings, a real taste of Africa, we hope you enjoy this spiritual journey. Remixes by:Alpha & Olmega (South Africa) & Pat Bedeau(Strictly Music) U.K.
deep house, house music, soulful house, strictly music. Bookmark.